Borderlinx | Buy BuyVIP and ship worldwide with Borderlinx. Cheap rates guaranteed. BuyVIP Germany is a premiere members-only shopping club, now owned by Amazon. Founded in Spain nearly a decade ago, BuyVIP Germany is one of its leading sites, along with Spain and Italy. Members take advantage of savings through online sales auctions, typically starting at 7:00 AM and running for 3 to 5 days. Shoppers can enjoy discounts of up to 70 percent off on lifestyle and fashion brands in apparel, accessories, beauty products, household items and electronics. Some travel deals are available as well. BuyVIP Germany boasts more than 500 prestigious brands, such as Converse, Tommy Hilfiger, Pepe Jeans, Timberland and Calvin Klein, just to name a few. This private club claims a total of more than 6 million members in Germany, Spain, Italy, Austria, Portugal, the Netherlands and elsewhere. BuyVIP Germany online tools encourage members to invite friends, and you can earn money for referrals to the BuyVIP Germany membership. You can experience even more savings with BuyVIP Germany as an Amazon Prime member and through the BuyVIP Germany Outlet shop. 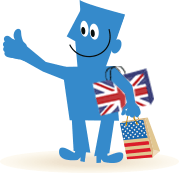 Members everywhere can now enjoy shopping BuyVIP in Germany and Borderlinx worldwide shipping! Determine upfront pricing on shipping with our tax & duties shipping calculator, and learn just how simple it is to use Borderlinx. You'll be thrilled with the great Borderlinx benefits we have available for you. A number of services are available through Borderlinx to make international ordering from BuyVIP Germany hassle-free, including shipment value protection, free repacking and consolidation services.